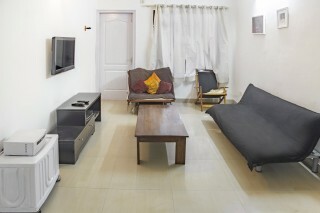 Located 900 m from Chapora Beach, this is an offering of a two-bedroom apartment, which can accommodate up to six people. This apartment is suitable for leisure travellers. The holiday home has a swimming pool. Generous parking area within the premises makes parking convenient for those on a road trip. Your Space The apartment forms part of a well-established modern building, dotted with tropical shrubbery. The lawn is equipped with a seating arrangement where you can sit with your travel companions and take in the lovely environs. The lawn is bordered by a tiled pathway where you can take long walks. You can take a refreshing plunge in the swimming pool after a tiring day of exploring Goa. The living area is fully furnished and features a couch, a two-seater sofa, a rocking chair, a coffee table, and a utility table for convenience. A wall-mounted LCD TV ensures that you do not miss out on your favourite shows. A functional kitchen with a cook-top, microwave, and refrigerator are present for added convenience. The air-conditioned bedroom is furnished with a plush double bed, bedside table, and a lamp for comfort. The en suite bathroom is well-appointed with modern sanitary ware. The room opens out to a balcony from where you can get a delightful view of the environs. Guest access Guests have access to the entire apartment on offer with a kitchen, the parking area, and the shared swimming pool. Guest interaction Host would be passing on all information regarding exploring Goa, and is always available with local help if needed. Pick up and drop service and renting vehicles can be done on request. Neighbourhood overview The property is just 5 minutes walking distance from the beach. Dramatic red cliffs and fresh water springs at a stones throw away makes Vagator Beach particularly pleasant for those who wish to watch the sunset from the rocks. Vagator Beach is mostly known for its laid-back culture and great bars playing the best music. With DJs from across the globe playing a beat or two, it is no wonder that the beach is a favourite amongst many music and party enthusiasts. These are a few more attractions nearby that guests can explore Vagator Beach - 1 km Anjuna Beach - 4.4 km Baga Beach - 8.1 km Calangute Beach - 9.6 km Candolim Beach - 12.2 km Sinquerim Beach - 14.2 km Mandrem Beach - 16.7 km Arambol Beach - 20 km Chapora Fort- 2.2 km Aguada Fort- 16.7 km Fort Tiracol - 33.1 km Getting around Madgaon Station- 53 km approx. Goa International Airport- 42 km approx. Chapora Bus Stand- 2 km approx. "In the vicinity of Vagator beach and Chapora fort"
This is the best place in Goa. Honestly I cannot stay anywhere else. This is one quality house and quite affordable as well. I stayed here with my kids and the locality is quite safe and accessible. The kids are obsessed with the beach, so it was an absolute blessing to have the beach literally at a walking distance! The caretaker is an angel and took great care of us and suggested some incredible places. The rooms were spotless clean and so sooo modern! Totally loved it! Since my kids are young, it was so helpful to have a kitchen accessible because you know how kids get hungry at the most random hours! The bedroom has massive windows which let in beautiful light, it was so refreshing to wake up with sunrise and witness the surrounding nature! Thank for this wonderful experience. My kids and I bonded on this vacation and I will cherish this holiday forveverrrr.